When Steve Phillips started as a 15-year-old apprentice with a Birmingham engineering company in 1961, the Beatles were still the Quarrymen and a pint of mild cost one shilling and threepence. Five years of dirt and grind, leg pulls, laughter and sheer hard graft later, Steve was a skilled turner and fitter, schooled the old-fashioned way by senior craftsmen who knew how to turn a screw, mill a die or grind a component to half a thousandth of an inch using manually-controlled machine tools, a micrometer and the skill in their fingers. He had also found the time – and saved the money – to marry his teenage sweetheart and buy a house. Steve went on to a varied and successful career in the manufacturing industry. Half a century on, now retired and living in Cyprus, he looks back on an era before computers and CNC machines, when Birmingham and its factories were the backbone of industrial Britain and families and workmates stuck together. 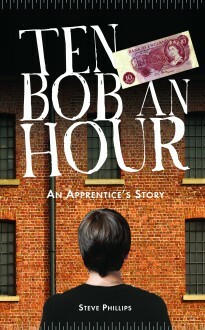 Ten Bob an Hour is a fascinating portrait of an era long gone.